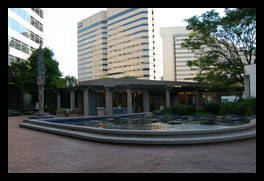 This is a large brick plaze with buildings all around it and a low fountain in the center. 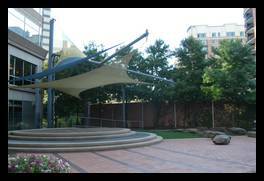 There are entrances to the plaza on Commerce Lane (stairs going between a group of trees), Woodmont Ave, Old Georgetown Rd (stairs going up next to the Safeway), and Wisconson Ave (a brick path with trees). 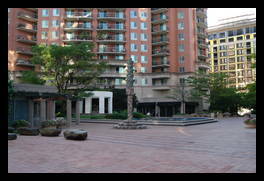 The focal point of the plaza is the fountain, which looks more like a pool with large stones in it (go ahead, jump from stone to stone). 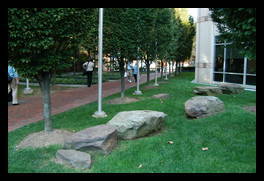 The hidden gem in this plaza is the entrance from Wisconsin Ave. 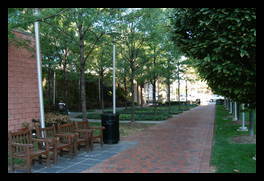 It is a brick path with lots of trees on one side and chairs under the trees. It is a great place to sit for a few minutes and relax. There is also a stage, and a couple of small patches of grass. The main plaza gets very hot sunny days. Although many people eat lunch on the plaza, there aren't any tables, so you have to somewhat awkwardly sit on a stone or a chair and balance your lunch in your lap. Trees yes Mostly at the entrance to Wisconsin Ave. Shade yes good At the entrance to Wisconsin Ave.